Devoted to a Record of the Facts, Philosophy, and History of the Communion Between Spirits and Mortals. Boston, MA. Publisher: Proprietors. Editor: Emma Hardinge Britten. 1/1, July 1872-1/6, December 1872. $4.00 a year, plus 24 cents postage. Destroyed in the Boston Fire of November 9-11, 1872. In its prospectus it promised the publication of volumes two and three of Britten's Modern American Spiritualism—only parts of which were ever printed—and "A short essay on Politics, Religion, Popular Reforms, or other leading topics of the day, by the WESTERN STAR CIRCLE OF SPIRITS." Mrs. Britten, as the "translator," most importantly publishes six installments of "Ghost Land: or, Researches into the Mysteries of Spiritual Existence" by "Austria," a "gentleman whose high rank in society is a less favorable warrant for his strict fidelity to truth, than the pure and unimpeachable character which he has earned from his fellow-men amongst whom he has moved in many public positions of honorable distinction during the last fifty years." This, with its "Flying Souls," "Berlin Brotherhood," and drugs, is one of the beginnings, along with P.B. 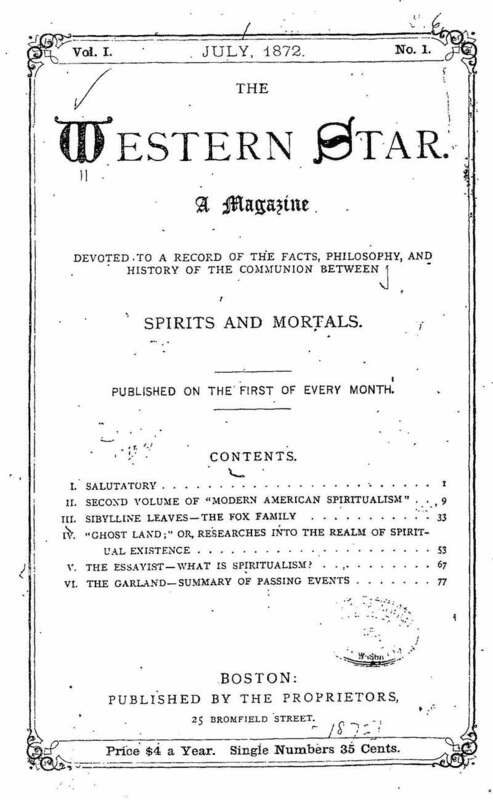 Randolph's works, of the transformation of spiritualism from a passive, receptive phenomenon into modern occultism. Boston Public Library; LOC; Yale University; and other locations.